Are your nieces and nephews caught up in the Fortnite frenzy? Here's everything you need to know about this popular video game. The Fortnite frenzy seemed to come out of nowhere -- almost as if it dropped from a party bus in the sky. And now many are taking notice of this rollicking game where players fight to the death. With Fortnite's millions of players and sudden success, you might be wondering: What's it all about -- and is it OK for the kids in my life? This survival-action game is a bit like what you'd get if you combined a sandbox-building game like Minecraft with an action shooter like Call of Duty. On one hand, it's getting major points with kids and grownups alike for building teamwork and thoughtful collaboration. On the other hand, it's a combat-based zombie game with tons of guns and violence. If your nieces and nephews say they're playing Fortnite, they're probably talking about Battle Royale, the free-to-play multiplayer offshoot of Fortnite. In this version, up to 100 people participate in a match together. Players are dropped onto the game map and must compete to be the last one standing by killing every other player in the game. During the game, players collect weapons, build safe structures, and try to avoid the Storm that damages all players outside of a safe zone. Unlike the Save the World version, there aren't any zombies to kill, which makes it a less scary version to play. However, players can buy items to make themselves look like a zombie or another creepy character. Save the World is the traditional solo campaign in the game Fortnite. 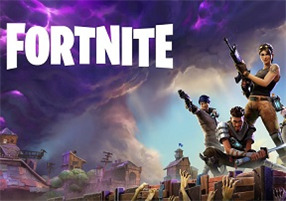 Unlike in Battle Royale, where players compete against each other, players in the Save the World mode are survivors of an apocalyptic storm where the few remaining humans must band together to defeat creepy zombie-like creatures called husks. Why is my niece or nephew so interested in playing Fortnite? There are many reasons why Fortnite has taken off with kids. One is that it combines two other genres that are big winners with young gamers. Another is that it has a more cartoonish look than some other gorier video games, so younger gamers are drawn to it. Kids can play with friends in Duos and Squads, creating a more social element. And popular YouTube and Switch gamers like DanTDM have also taken to playing the game on streaming sites. Plus, in the case of Battle Royale, it's free (although it does have in-app purchases -- more on that below). For some, the cartoonish, bloodless style of the action in Fortnite makes the violence less problematic than the aggressive gore in other popular shooter games. But the game's online chat feature -- especially in Battle Royale -- could expose younger players to offensive language or mature content from random strangers. Common Sense doesn't recommend games with open chat for kids under 13, but with the right controls and parental guidance, this can be a tween-friendly alternative to violent first-person shooters. Common Sense recommends Fortnite for teens 13 and up, primarily because of the open chat and action violence. There are frequent opportunities for players to spend real money on items in the game. Fortnite encourages purchases such as upgrades to editions such as Deluxe and Super Deluxe, as well as in-game currency to buy bonus items. There's also the Premium Battle Pass, a $10 subscription that lets players compete on more levels and win exclusive game skins/costumes. Fortnite is available on PlayStation 4, Xbox One, Windows, and Mac. Users need an internet connection to play. A mobile version is also coming to iOS and Android for a limited number of players. How is Fortnite connected to Twitch? Some kids aren't only playing Fortnite -- they're watching other people, including celebrities like Drake, play it on Twitch. Twitch is a social media platform for gamers where they can livestream themselves playing popular video games, including Fortnite. Livestreaming can be unpredictable, so make sure to check out which gamers kids are watching, and if kids say they want to livestream themselves, carefully consider the risks. How do I manage screen time for my nieces and nephews when they're with me, playing Fortnite? When each match only takes 20 minutes, it's easy to fall into the trap of "just one more" -- sort of how you end up binge-watching an entire season of Stranger Things. But you can take advantage of the quick matches by using them as a natural stopping point in gameplay. Some kids benefit from using a timer, limiting themselves to a certain number of matches per day, or using one of these tips for finding a balance between gaming and other activities. Home Expertise The Fortnite Craze, Explained!